A node is a basic unit of a data structure, such as a linked list or tree data structure. Nodes contain data and also may link to other nodes. Links between nodes are often implemented by pointers. In graph theory, the image provides a simplified view of a network, where each of the numbers represents a different node. 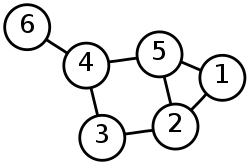 A simple binary tree of size 9 and height 3, with a root node whose value is 2. The above tree is unbalanced and not sorted. Nodes are often arranged into tree structures. A node represents the information contained in a single data structure. These nodes may contain a value or condition, or possibly serve as another independent data structure. Nodes are represented by a single parent node. The highest point on a tree structure is called a root node, which does not have a parent node, but serves as the parent or 'grandparent' of all of the nodes below it in the tree. The height of a node is determined by the total number of edges on the path from that node to the furthest leaf node, and the height of the tree is equal to the height of the root node. Node depth is determined by the distance between that particular node and the root node. The root node is said to have a depth of zero. Data can be discovered along these network paths. An IP address uses this kind of system of nodes to define its location in a network. Child: A child node is a node extending from another node. For example, a computer with internet access could be considered a child node of a node representing the internet. The inverse relationship is that of a parent node. If node C is a child of node A, then A is the parent node of C.
Degree: the degree of a node is the number of children of the node. Depth: the depth of node A is the length of the path from A to the root node. The root node is said to have depth 0. Edge: the connection between nodes. Forest: a set of trees. Height: the height of node A is the length of the longest path through children to a leaf node. Internal node: a node with at least one child. Leaf node: a node with no children. Root node: a node distinguished from the rest of the tree nodes. Usually, it is depicted as the highest node of the tree. Sibling nodes: these are nodes connected to the same parent node. Another common use of node trees is in web development. In programming, XML is used to communicate information between computer programmers and computers alike. For this reason XML is used to create common communication protocols used in office productivity software, and serves as the base for the development of modern web markup languages like XHTML. Though similar in how it is approached by a programmer, HTML and CSS is typically the language used to develop website text and design. While XML, HTML and XHTML provide the language and expression, DOM serves as a translator. A node object is represented by a single node in a tree. It can be an element node, attribute node, text node, or any type that is described in section "node type". All objects can inherit properties and methods for dealing with parent and child nodes, but not all of the objects have parent or child nodes. For example, text nodes that cannot have child nodes, similar nodes to add child nodes results in a DOM error. ^ "tree (data structure)". National Institute of Standards and Technology. Archived from the original on 2014-11-24. ^ Teukolsky, Roselyn (2013). Barron's AP Computer Science A. Barron's. ISBN 978-1-4380-0152-4. ^ "Simply Scheme: Introducing Computer Science ch 18: Trees". College Of Engineering, University of California, Berkeley. Archived from the original on 2013-12-22. ^ "XML DOM Introduction". W3Schools. Archived from the original on 2014-06-11. This page was last edited on 22 March 2019, at 10:56 (UTC).